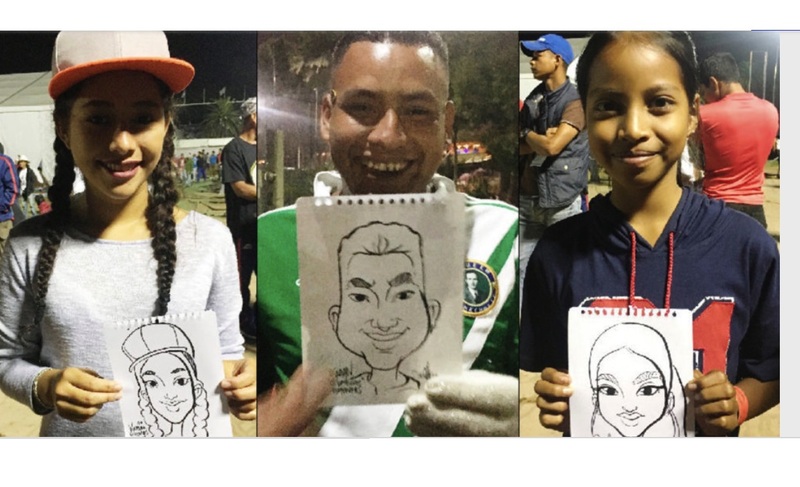 A third-generation Mexican-American artist hopes to show fellow Americans a more personal view of individuals in the migrant caravan making their way to the United States from Central America. “It was hilarious, delightful, and the joy and courage of this crew is truly contagious,” Baily told HuffPost. President Donald Trump has been claiming the caravan is an invasion, filled with terrorists, gang members and drug dealers. But Baily’s drawings show the worn but hopeful faces of people in the midst of an epic trek from poverty and violence in their home countries to the U.S., where many aim to apply for asylum. Trump, whose campaigning ahead of last week’s elections relied on fear of the migrants, ordered more than 7,000 active-duty troops to the border to deter asylum-seekers. He has been silent on the topic on social media since the election. Mexico City officials turned a stadium into a camp where the migrants could pause on their journey, and “offered them every type of city service,” according to The New York Times. Doctors and dentists provided free checkups. The caravan departed on Saturday morning to continue the walk north. Baily said 25-year-old Jean Carlos told her he’s from Choloma, Honduras, worked in a bodega, goes to church every Sunday, loves to drive, and one day hopes to own a Mazda. He’s heading to Canada with cans of tuna in his pocket. Two young girls, Lincy and Nataly, are traveling with their mother, father, and 1-month old brother, who was born in Honduras just before they left. Lincy told Baily that she hates brushing her hair. Nataly loves to draw. “Sitting with someone to do their portrait is a very personal exchange,” Baily said. The mood of most of those she talked to, she added, is dominated by hope.